"Some trails are happy ones. It's the way you ride the trail that counts." If you follow the path marked by the yellow-gold flowers of Sunshine Happy Trails, it will lead you to a bright gardening future! In this case, 'trails' is a perfectly chosen word as it describes the plant growth very well. The vigorous and floriferous plants are neither rounded nor compact. They are spreading and trailing low to the ground like a true Ground Cover rose should do. 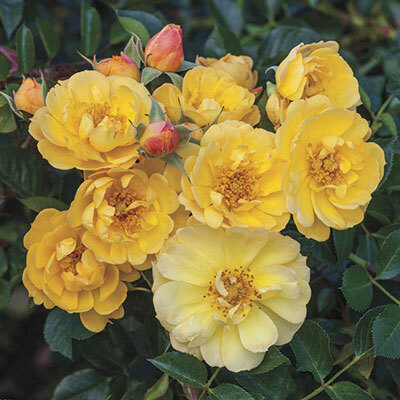 To get sunshine every day in your garden even on cloudy days, there's no better choice than this rose! The cheerful flowers are produced in abundance even in the fall on medium-sized clusters. And if you need to leave a trail of fallen petals to mark your way, rest assured that you'll be able to see them clearly because the petals of this delightful variety will hold a nice yellow coloration until the end.